January 2014 Update. All of the original rally sites have now been reserved. You may call the resort to see if additional space is available. 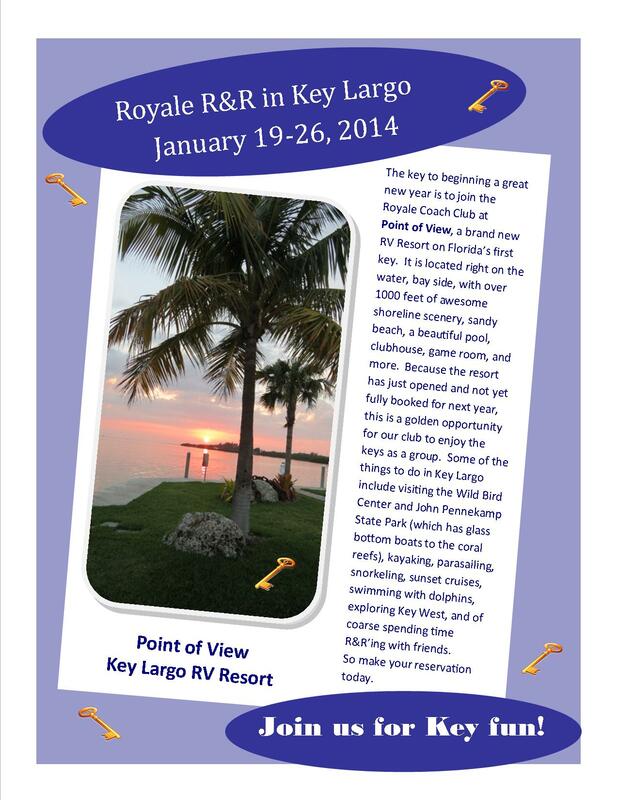 Welcome to an informal “R&R” get together with Royale friends to Rest, Relax, Renew, Recreate, Rejuvenate, Reminisce, Refresh, and any other positive “R” words that come to mind. The dates are the week of January 19 – 26, 2014. You can reserve for a longer or shorter period, if desired. Call the resort at 305-451-5578. Let them know you are with the Royale Coach Club. Select a site (see PDF with details above), and confirm your arrival and departure dates. Pay a registration deposit of $125. You will receive a confirmation and receipt by email. Send an email to royalecoachclub@mindspring.com or call 336-674-2127 to let us know you have registered.